"Eta Carinae the Enigmatic Explosive Star Probed by NASA NUSTAR"
Eta Carinae, is a well known massive, luminous star system located about 7,500 light-years away from the Earth. It is in the southern constellation of Carina, and produced an outburst in the 19th century making it the second-brightest star in the sky. Since then, Eta Car has been well studied but still it holds fascination for astronomers studying explosive star systems. It has two massive stars that come very close to each other every 5.5 years. The system has intense outflows which accelerate charged particles to an amazing speed and can produce energy bursts that can be observed by many telescopes. Studies with the NuSTAR space telescope recently have helped characterize the outbursts and the types of particles sent our way. 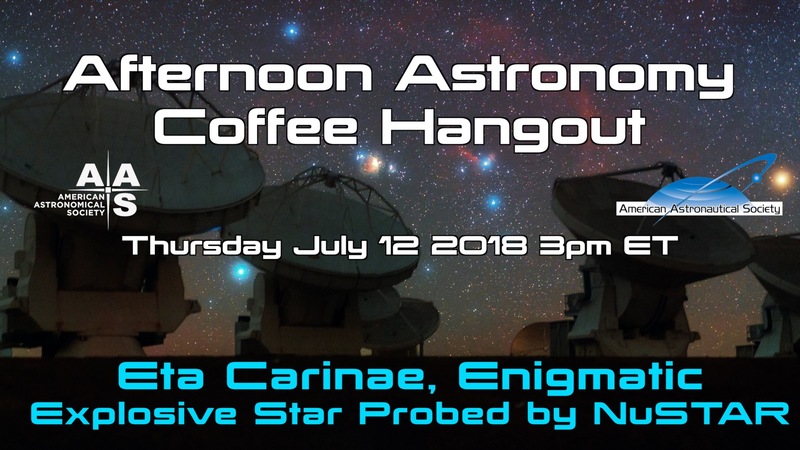 Join Tony Darnell and Carol Christian during Afternoon Astronomy Coffee on Thursday, 12 July at 3:00 pm Eastern Daylight Time (19:00 UTC) as they discuss with the investigators, including Kenji Hamaguchi (Goddard Space Flight Center and University of Maryland) and Michael Corcoran (Goddard Space Flight Center and Catholic University) how they probed Eta Car with NuSTAR to understand the system, and describe this interesting NASA mission that probes the high energy universe.